The Temple Mount has been the focus of a surge in deadly violence, over the years, most recently in [October 2015], with Israelis and Palestinians casting blame on one another for fueling the unrest that has gripped Jerusalem, the city holy to the world’s three major monotheistic religions. What is the Temple Mount, and why is it significant to the faithful? For Muslims, the Temple Mount site is known as the Haram al-Sharif, or the Noble Sanctuary, and is considered the third-holiest site in Islam, after Mecca and Medina in Saudi Arabia. It is where Muslims believe the Prophet Muhammad ascended to heaven and houses the Dome of the Rock shrine and Al-Aqsa mosque. David Brog, executive director of Christians United For Israel, described how Muslim sites came to be constructed on the Temple Mount. In a more recent effort to erase the Jewish connection to the site, the Palestine Liberation Organization in early October 2014 issued an advisory to the international media, asking the site no longer be referred to as the Temple Mount. Instead, the PLO suggested reporters say the “Al-Aqsa mosque compound,” even though the mosque was built hundreds of years after the Jewish Temple. For Christians, the site is significant for a similar reason it is holy to Jews: It was a place Jesus visited and celebrated Jewish festivals. It’s also where Jesus challenged the corrupt practices taking place in the Temple and predicted in Mark 13 that the Temple would ultimately be destroyed. Who currently controls the Temple Mount? During the 1967 Six Day War, Israel captured the Old City and along with it, the Temple Mount. However, Israeli leaders decided to allow the Islamic Waqf trust to continue running the site, with its housing of Islamic structures, including the Al-Aqsa mosque. Today, while the Waqf governs the Temple Mount itself, Israel controls the site’s entrances and — during periods of heightened tensions — can decide to limit visitors. Indeed, in response to the increased violence over recent weeks, Israel has on some days allowed only Muslim men over age 35 — and sometimes only over age 50 — to visit the Temple Mount, in an effort to reduce cases of Palestinian protesters throwing rocks, Molotov cocktails and firecrackers. After a well-known rabbi was shot in Jerusalem in September 2014, Israel closed the site for a day to both Jews and Muslims to try to prevent the spiraling of violence. Why has there been violence surrounding the Temple Mount (in October 2014)? Israeli officials, including Prime Minister Benjamin Netanyahu, blamed Palestinian Authority President Mahmoud Abbas and his colleagues for fanning the flames of violence in Jerusalem in Oct. 2014, during which 11 Jews have been killed in Palestinian terror attacks, including a 3-month-old American girl who was intentionally run over by a Palestinian driver and a synagogue massacre. They pointed to an October 2014 speech by Abbas when he said Jews must be barred from visiting the Temple Mount using “any means” necessary, which in Israel was interpreted as a call to arms. In November 2014 Secretary of State John Kerry seemed to back Israel’s assertion that the words of Palestinian officials have had dire consequences, and he demanded that Palestinian leaders stop inciting to violence. Palestinians were angry that some prominent right-wing Israeli politicians in Nov. 2014 promoted easing restrictions on Jewish visits to the Temple Mount. They say recent high-profile visits by Jewish lawmakers sparked the unrest. At the same time, no Palestinian protest was registered when a Muslim member of Israel’s Knesset visited the site. Israel considers Jerusalem to be its eternal united capital, while Palestinians claim east Jerusalem as the capital of any future state. Here, religion is intricately intertwined with politics, as was demonstrated again when in Nov. 2014 Abbas announced he planned to move PLO founder Yasser Arafat’s remains to Jerusalem. 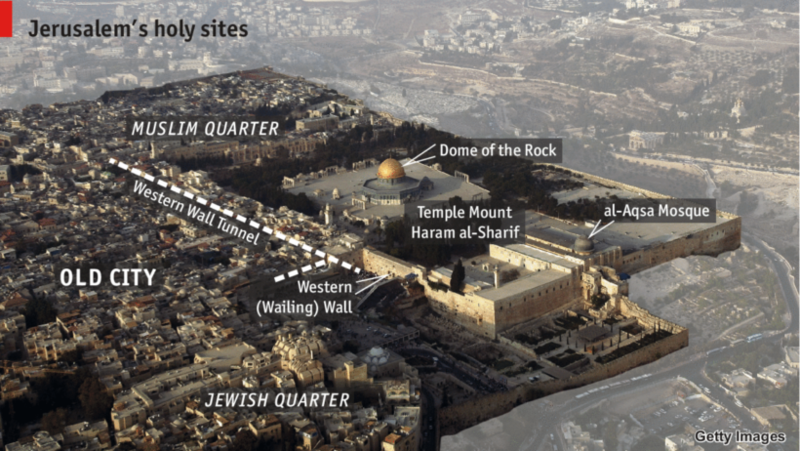 With competing claims to the Temple Mount, what are the prayer arrangements on the site? Muslims are free to pray at the site, though depending on police security assessments, those allowed to enter are at times limited by age. Jews are allowed to visit, but under Israeli regulations, are not allowed to pray visibly there: no prayer books displayed, no group worship, no audible blessings. Israeli officials say the restrictions are an effort to keep tensions at a minimum by not drawing protests from Muslims to Jewish prayer. While some Israelis support changing the status quo, many in the ultra-Orthodox community oppose any Jewish visits to the Temple Mount, because they believe that it is forbidden for Jews to tread on the ground where the inner sanctuary once stood: a spot only the high priest was allowed to enter. Jewish visitors have repeatedly complained that visiting the Temple Mount, they have been met by organized groups of Muslims shouting and taunting them. At times, the harassment has included throwing objects, such as chairs, at Jewish visitors. Israeli officials accuse Islamist organizations of paying salaries to Palestinians to stake out the site and harass visiting Jews. He repeated the assertion at a news conference following the massacre at Jerusalem synagogue in 2014, as he blasted the Palestinian Authority for inciting violence and knowingly spreading false accusations that Israel has designs to change the prayer restrictions on Jews on the Temple Mount. What about other “inappropriate” behavior that’s taken place there? Besides the harassment of Jews visiting the Temple Mount, images posted online have shown Palestinians posing with mock missiles, playing soccer, and throwing rocks, Molotov cocktails and firecrackers from inside the Al-Aqsa mosque. The British newspaper the Telegraph posted a video in Nov. 2014 showing numerous firecrackers and large rocks being fired at Israeli police from inside the Al-Aqsa mosque. What are future prospects for Temple Mount? Palestinians insist east Jerusalem will be the capital of their future state. 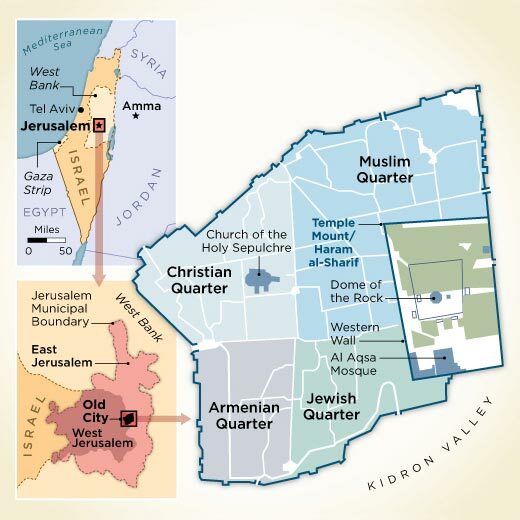 Jerusalem’s Old City and the Temple Mount are geographically located in east Jerusalem, so the Palestinian expectation is the site would fall under their jurisdiction. When President Barack Obama declared in 2011 that future borders should be based on lines that existed before the 1967 Six Day War, the implication was that the U.S. supported Palestinian control of the Temple Mount. For Israel, that’s a nonstarter. In previous instances where Jewish holy sites were handed over to Palestinian Authority control, the results were less than ideal: Under the 1993 Oslo Accords, Joseph’s Tomb in Nablus was supposed to remain under Israeli control. But the Israeli army quickly evacuated the site in 2000 due to Palestinian unrest linked to the second intifada. The tomb was swiftly ransacked and burned by Palestinians. There have also been numerous Palestinian attacks on Jewish worshippers visiting the site of Rachel’s Tomb in the Bethlehem area.